Playmakers Aries Echanova of FR Spoilers and Dennis Castro of Western Union shared the top podium during Sunday’s Filipino Basketball League (FBL) awarding rites held at the Sunset Park. Echanova was named as the Finals MVP while Castro was judged as the Season MVP. Joining them in the podium list were Jun dela Cruz of FR Spoilers (Best Coach), Liquid Skyy Co. (Sportsmanship Award), Nico Hinoza of RP Rangers (Teammate of the Year), Mark Pagayanan of FR Spoilers (Defensive Player of the Year), Dovie de Jesus of Ilocandia Bulls (Most Improve Player), and Jose Tabaquero Jr. of Surangel Stars (Rookie of the Year. For the Mythical Five named were Michael Bombita of FR Spoilers, Arnold Undecimo of Surangel Stars, Dennis Castro of Western Union, Aries Echanova of FR Spoilers and Mark Pagayanan of FR Spoilers. Certificate of appreciation were given to the participating teams for this year’s season namely defending champion FR Spoilers, runner up Western Union, Surangel Stars, Ilocandia Bulls, RP Rangers, PRA Choppers, Hanpa Cardinals, Jaguars, PNQ Rams, Liquid Skyy and guest team the Palau Junior National squad. On the other hand, trophies were given to the defending champion FR Spoilers, runner up Western Union, third placer Surangel Stars and fourth place RP Rangers. The event was graced by Palau Basketball Federation Vice President and Development Officer Topps Sungino with FBL chairman Alex Gatchalian, FBL advisers Engr. Bobby Pineda and Ben Asuncion welcoming all the participating teams and guests. Certificate of appreciation were also presented to the 2013 FBL Committee headed by chairman Alex Gachalian, vice chairman Jerald Ismael, secretary Marchelle Dancel, treasurer Ligaya Sara, members Lucio Bandibas, Rey Carbonel, Boie Castaneda, Rey Fortuz, Judian Gahaton, Conrado Almanzar, Frank Merico, Arsie Sumampong and Joseph Verano with advisers Jun dela Cruz, Engrs. 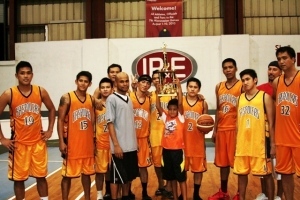 Bobby Pineda and Ben Asuncion. Certificate of appreciation were also given to the 2013 FBL sponsors namely Aqua Pure Water, ATT Disco Bar, Budget Mart II, FR Construction Co., Kabayan Restaurant, Palasia Hotel, Palau Royal Resort, Palau Plantation Resort, Surangel and Sons, VMJ Construction Co., Fortune Investment and Development Corp., Jun dela Cruz and Engr. Bobby Pineda.